In Ceylanpınar, reaching the local communities is more important than ever to save the Sociable Lapwings. Sheppeards belong to key groups essential to undertake community based conservation in the area. Many people already wrote plenty of papers and defined various issues on migration and conservation of the Sociable Lapwing I guess. Detailed research projects are implemented, species action plans are developed and the causes of the species’ extinction are clarified in fine detail. Conservation scientists do their best to cure these problems. Although most often, successful conservation work originates from logical planning, these plans may appear remarkably unconventional during the ongoing unrest in some parts of the world, and, our story passes in an area like this. During his PhD research, one of my friends interviewed local people who are clearing relict Oriental Sweetgum (Liquidambar orientalis) forests in Fethiye to cultivate citrus orchards. He couldn’t help but notice the feeling of guilt in these people as they harm the forest, which was sacred according to their indigenous beliefs. They were involved in such a practice, for which even their families despised them, yet they kept on doing it. In other cases, I’ve encountered many people such as a herdsman who daily bought meat from local butcher to take care of an Egyptian vulture fledgling with his daily income or a grandfather who was feeling frustrated after a wet meadow at the Euphrates Basin was drained, where a pair of cranes used to breed. What I learnt from them was thousands of years old bonds between nature and people, still persisting in remote mountains and vast plains of Anatolia. What can encourage a group of birdwatchers to conduct a field survey during the most furious battle between YPG and ISIS. I believe the answer to this question is important to better understand the bounds between people and nature. Urfa, Ceylanpınar Key Biodiversity Area harbors one of the largest single piece farmland in the world. It’s adjacent to Syrian Border and owned by the Turkish State. The same area is also a key working area for Doğa’s (BirdLife Turkey) staff and volunteers, being home for one of the most threatened bird species in the world, the Sociable Lapwing. There are only 5,600 breeding pairs of this Critically Endangered (CR) species according to BirdLife International. Every year they stage and feed here, where, at the same time a harsh war goes on. “Sociable lapwing flocks are resting and feeding in rain-fed arable fields, they stop over for some time, then they leave for further south. The small rain fed parcels are extremely important as the irrigated cultivations covered majority of the landscape in the recent years. Therefore, the bird flocks tend to congregate in these small areas. Even a single individual means hope for the team in the area” says Turan Çetin, the Steppes Officer of Doğa. The Sociable lapwing monitoring team of Doğa had managed to visit the area despite the conflict in the region and conducted their work on 4-5-6 October 2015. All team members of the monitoring team are well aware of the severity in traveling by 4×4 field vehicle with binoculars, optical equipment on board in an active warzone. The study area is only thirty kilometers away from the Syrian border. The officials and the locals help the team during this effort, while they remain astonished by their dedication to the cause. Reaching the local communities is more important than ever. For team members, salvation of a single sociable lapwing individual is significant for the viability of the population. The team’s immediate goal is to stop the poaching in the area, while they continue the lobbying activities to prevent the shrinkage of rain fed agriculture lands. The team consists of certified volunteer hunting inspectors and officially entitled to conduct controls on hunters. The team of ten travels in the region and contact hunters to inform them about the species. As a result of this awareness work, the hunters can successfully identify sociable lapwings and many swore not to shoot them again. The team members are widely respected by people of the region, they know the hunters by name, conduct regular meetings with them and locally recognized as dedicated conservationists. By their efforts, some hunters have already sold their rifles and bought cameras. 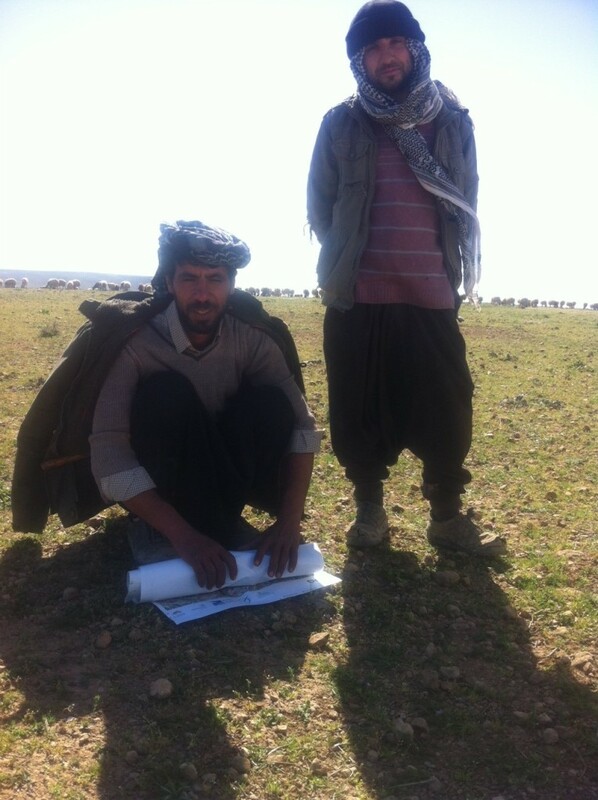 Ahmet, who is a former hunter and member of Sociable Lapwing Team, happily talks about their success in declaration of hunting free zone within the state farm territory. Despite the war, the local conservation activities didn’t stop. Another member of the team, Hayat tells that the team is eager to continue the monitoring of the birds. The warzone ignores the fundamental rights such as the right to live or the rights of nature, however love seems to thrive, owing to tradition, originating from integrity of local people and nature. If the loss of the bond between people and nature is one of the drivers behind the extinction, each time this bond revives, it saves the life of at least one individual in some part of the world. And I know that this readily took place in Şanlıurfa, Ceylanpınar.